Check out Arrow Video June Schedule! As spring begins to turn into summer, Arrow Video has some real treats in store for cult film fans, with a fantastic blend of horror and action in June. 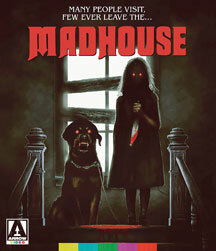 First up, Arrow Video brings you the classic Madhouse, a terrifying bloodbath that is fantastically gruesome. Directed by Ovidio Assonitis (The Visitor,Piranha II: The Spawning) this Italian production was shot entirely on location in Savannah, Georgia and blended the OTT excesses of Italian horror with the traits of the US slasher movie trend. A must-view for fans of grisly cinema. 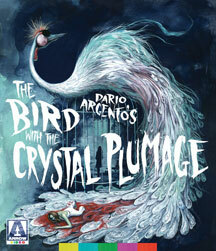 This month's Limited Edition release comes in the form of Dario Argento's acclaimed directorial debut, The Bird With the Crystal Plumage. This is the film that redefined the giallo genre and began Argento's golden era of filmmaking. With the Dual Format release gorgeously showing off Vittorio Storaro's sumptuous cinematography and Ennio Morricone's seductive score, the film has never looked or sounded better as it does here with its brand new 4K restoration. 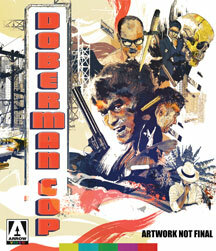 Last but not least is a treat for fans of Japanese cinema with the release of Kinji Fukasaku's Doberman Cop. Never before released on video outside Japan, this oddity is based on a popular manga and was released just as the popularity of the yakuza movie was waning. Starring Shinichi "Sonny" Chiba, this American-style crime film is an action-comedy that's one of Fukasaku and Chiba's most enjoyable films as Chiba channels a Japanese Dirty Harry. A real missing link in 1970s Japanese cinema. As always, all of the Arrow Video releases are packed with fascinating special features for cult film fans to really sink their teeth into. MANY PEOPLE VISIT ... NO ONE EVER LEAVES. Helmed by legendary producer/director Ovidio Assonitis, the man behind such cult favourites as The Visitor and Piranha II: The Spawning, Madhouse is a crimson-soaked tale of sibling rivalry taken to a terrifying and bloody extreme. Julia has spent her entire adult life trying to forget the torment she suffered at the hands of her twisted twin Mary... but Mary hasn't forgotten. Escaping hospital, where she's recently been admitted with a horrific, disfiguring illness, Julia's sadistic sister vows to exact a particularly cruel revenge on her sibling this year - promising a birthday surprise that she'll never forget. An Italian production shot entirely in Savannah, Georgia, Madhouse (aka And When She Was Bad and There Was a Little Girl) fuses slasher elements with the over-the-top excess of '80s Italian terror - resulting in a cinematic bloodbath so gut-wrenching that the British authorities saw fit to outlaw it as a "video nasty". In 1970, young first-time director Dario Argento (Deep Red, Suspiria) made his indelible mark on Italian cinema with The Bird with the Crystal Plumage - a film which redefined the 'giallo' genre of murder-mystery thrillers and catapulted him to international stardom. Sam Dalmas (Tony Musante, We Own the Night), an American writer living in Rome, inadvertently witnesses a brutal attack on a woman (Eva Renzi, Funeral in Berlin) in a modern art gallery. Powerless to help, he grows increasingly obsessed with the incident. Convinced that something he saw that night holds the key to identifying the maniac terrorizing Rome, he launches his own investigation parallel to that of the police, heedless of the danger to both himself and his girlfriend Giulia (Suzy Kendall, Spasmo). A staggeringly assured debut, The Bird with the Crystal Plumage establishes the key traits that would define Argento's filmography, including lavish visuals and a flare for wildly inventive, brutal scenes of violence. With sumptuous cinematography by Vittorio Storaro (Apocalypse Now) and a seductive score by legendary composer Ennio Morricone (Once Upon a Time in the West), this landmark film has never looked or sounded better in this new, 4K-restored limited edition. Made to appeal both to the youth market with its biker gangs and popular music, as well as to old-time yakuza movie fans, Doberman Cop is an surprising oddity in Fukasaku's career, his sole film adapted directly from a manga and never before released on video outside of Japan. Featuring Chiba at his charismatic best -- channeling a Japanese Dirty Harry while doing all his own stunts -- and Fukasaku at his most fun, deftly showcasing the combined talents of his "Piranha Army" stock company of actors and other regular players -- Doberman Cop is a classic action comedy and a missing link in 1970's Japanese cinema deserving of rediscovery. FIRST PRESSING ONLY: Illustrated collector's book featuring new writing on the films by Patrick Macias and Tom Mes.